Sorry about the long hiatus! 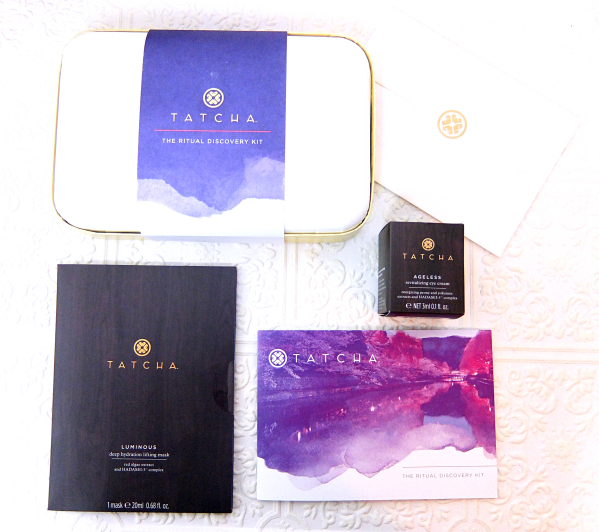 I had received the Tatcha Ritual Discovery Kit before the trip and of course I made sure to pack it along. This beautiful set turned out to be another sane part of my rather insane trip! Tatch Ritual Discovery Kit contains four essential products so you can experience them in a sense of whole regimen before committing to full sized items. Tatcha says it is good for a full 2-week regimen, which is about right for the Clenasing Oil and the Serum only because I generously applied them on my face - for example, I slathered the serum on my face and neck twice a day. Polished gentle enzyme powder and Supple moisturizer last way longer than that at least from my own experience. The kit comes in a beautiful gold-rimmed paper box and all the items are secured in a plastic mold inside. I was also sent a mini jar of Ageless Eye Cream and a Luminous Deep Hydration Lifting Mask which are so lovely that they deserve a separate post. This delicately scented cleansing oil is made with a blend of camellia and rice bran oils. Compared to miniral oil based ones, it has less slip yet requires only a small amount to get the job done. Honestly, I do not have qualms about mineral oil but it does feel good that I am rubbing on natural oil that are potentially beneficial for my skin. Plus it washes away much cleaner. My skin is not all that sensitive and I can probably use The Classic one with no problem (Elena agrees), but I am glad that they sent me the Gentle one since I can use it twice a day. It lathers very finely and works flawlessly as a gentle morning cleanser as well as a polisher in the evening. My skin feels so clean and fresh every time. It is a better version of my all time favorite, Dermalogica Daily Microfoliant, I must say. I do wish it came with a flip top instead of the screw-on lid which is very pretty but not exactly the most practical. This serum is just outstanding! Upon the very first time of application, I've instantly noticed it calms down the redness on my cheeks. I've been using it for a month now and couldn't be happier. No sign of irritation whatsoever. "Brightening" is always a very attractive concept in skincare but unfortunately we don't have many safe options. If you're afraid of the harsh hydroquinone or kojic acid, this is a superb choice. The serum hydrates beautifully without being greasy. I use this under my sunscreen during the day and layer with Supple Moisture Rich Silk Cream in the evening. Tatcha is all about better ingredients and Supple is the very example. You will be amazed to see how easily this gel-cream glides on leaving skin perfectly bouncy and moisturized. Similar silky feel you'd get from many cream with silicones, but it is actually from liquid silk, squalane, royal jelly and HADASEI-3 Bioactive complex. Again, I don't really mind silicones in my cosmetic items and it is really difficult to find silicone free makeup anyway, but it is definitely comforting to know my feel-good skincare products is actually good for my skin. I've also purchased the Luminous Deep Hydration Firming Serum and Dewy Skin Mist and am planning to add Ageless Enriching Renewal Cream as soon as the Tatcha Annual sale starts. Overall, the whole range has thoroughly impressed me and now I know all the glowing reviews on Tatch skincare are not just myths! I look forward to seeing even better results as I continue with the Tatcha regimen. Haaai welcome back, Lena! This set definitely arrived at the right time! I still haven't tried anything from the brand because I can't seem to find it here (and I don't want to pay 35 bucks to have anything shipped here, only to have the parcel taxed by the customs...). As soon as it becomes more available, I definitely plan to tho! I ended up appreciating the set even more because of the trip. I was tired and stressed out the whole time but didn't experience any breakout. I think the set really deserve some credit! Welcome Lena! I love San Fran! One of my favourite cities for sure. I have not tried the brand either, but I want to some day as everyone just raves about it! Hope you have a chance to try Tatcha soon. It is very soothing more than anything. I think you'd love it. It is definitely a luxury but well worth the price, I must say. I'd highly recommend the trial kit. Everything is adorable and lasts for quite some time which will give you enough time to decide. Oh this post just makes me want to try Tatcha even more, this kit sounds like a very good start.. I haven't read any negative reviews on the brand so far, and the packaging is just so beautiful! Everything is so well done although they don't have gazillion products lined up like mass department store, which I think is another great charm of the brand. They are really lovely. OOOO even better than the dermalogica eh?? i've been super wanting to try dermalogica's and tatcha's...so i might just go with this discovery set first. It almost pains me to admit since I've been swearing by the Dermalogica for many years, but yes, Tatcha is better. ;p For one thing, the consistency is much finer. I placed an order for the Ageless cream after trying some in store. It would work perfectly for my winter skin and I'm very excited about it! The whole line is wonderfully therapeutic yet high performance. It is luxury items but if you have a budget for department store brand skincare, Tatcha is very comparable and even better in many ways, imho. I'm dying to try some TATCHA but I think I'll have to wait until next year. Way too much skin care at the moment and the $20 shipping charge to Canada kills any joy I get from the FF discount. Hopefully I'll just be able to scoop it up in a Barney's in person! I really thought I would be able to blog a few times since I already had some pictures taken sitting in my Google drive. Unfortunately, I came back to the hotel room completely exhausted and had no creative juice left. ;o It is good to be back finally. I just decided to close my eyes firmly for the holiday makeup. It actually feels good to invest in skincare. Yes, I believe so. The consistency is much finer and leaves my skin super clean. Welcome back form the left coast Lena! This kit sounds lovely but so does everything else in the Tatcha product line. If I weren't swimming in beauty products now, I'd definitely be partaking in their sale right now. Glad to hear these are working so well for you though. I have samples of the cleansing oil and rice enzyme which I've yet to try. 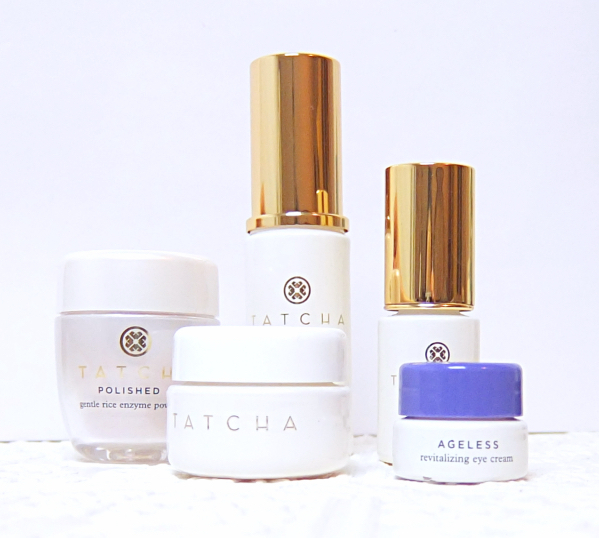 I'd definitely like to review some more Tatcha for theNotice, but so far I've really been loving their Gentle Rice Enzyme Powder and cleansing oil -- the exfoliator is really amazing for sensitive skin. Even I can use the Classic version if need be, and my skin is so sensitive that I can't even use a lot of regular (non-exfoliating) cleansers! I'm so glad you are enjoying Tatcha! I only discovered the range this year, and i love everything they carry! Need to put Supple on my list next time... i've only tried the Ageless Enriched Renewal Cream but that is too rich for my skin. Having Tatcha regimen in my routine is a big thing for me, too.